This photo is courtesy Nancy Benton who supplied identification. 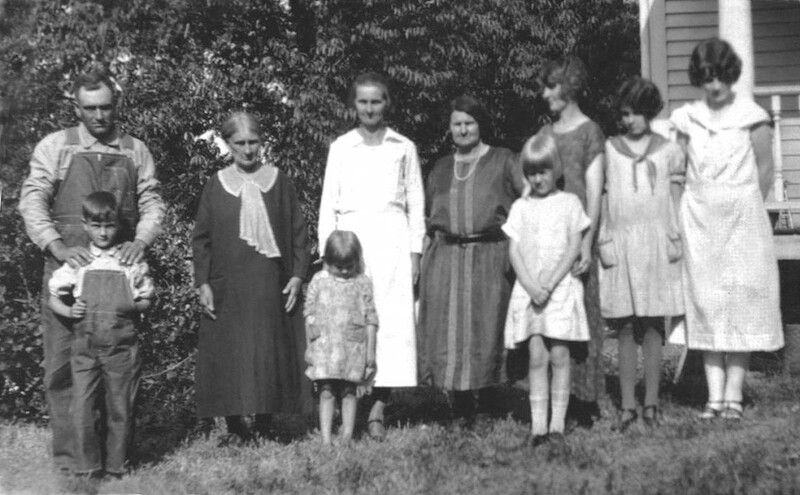 Left to right: Levy Jones with hands on son Herbert’s shoulder, Delana Brewer, Mary Brewer Spurling with Katherine (child of Mary or Jessie) in front; Jessie Brewer Jones; Bettie Brewer Noyes with Lena Minor in front; Mary Lou Noyes and Dorothy Noyes. Delana Fowler Brewer was the wife of David Nathaniel who’d died in 1921 in Greenfield, Dade, Missouri. Levy Jones was a son-in-law, husband of daughter Jessie. Mary Brewer was another daughter, as was Bettie Brewer Noyes, wife of Ray Noyes. Mary Lou and Dorothy were daughters of Bettie Noyes. Lena Minor was a granddaughter of Bettie Brewer Noyes by Cora Vera Noyes and John J. Minor, Cora’s first husband. 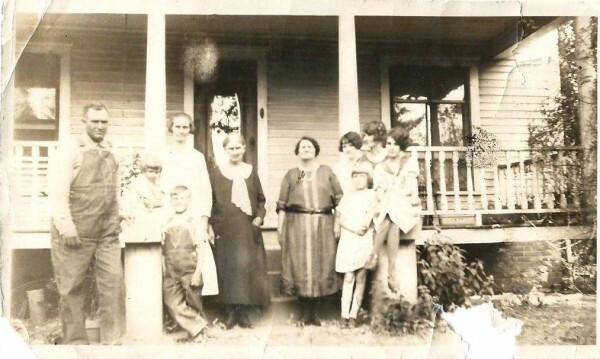 Wonderfully enough, Jim and Dieanna Swearngin sent me a photo from the same reunion that had come down through Dieanna’s family which shows everyone gathered in front of the porch. 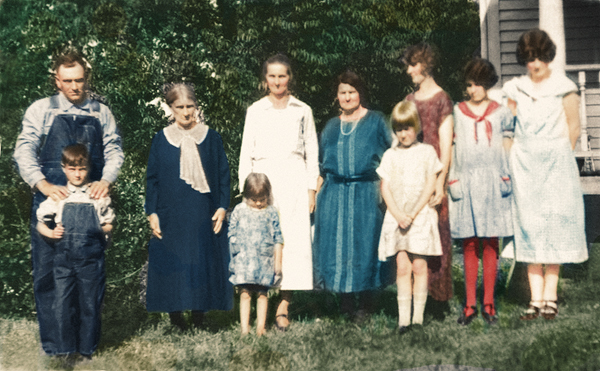 From the look of the front porch, I think this photo was taken at the Ray Noyes home in Liberal, Missouri.